Executive Chef Jim Mercer and his culinary team recently kicked off the “Members Favorite Cookbook Dinner” series at the Golf House restaurant. Â The dinner was inspired by the current best selling cookbookÂ JerusalemÂ by Yotam Ottolenghi and Sami Tamimi. 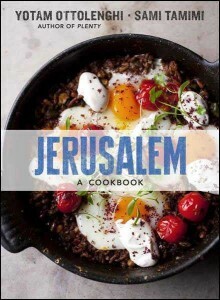 Â Released in 2012, the book contains aÂ collection of 120 recipes exploring the flavors ofÂ Jerusalem. Members filled the restaurant and dined from a menu created exclusively from the book. Â They were treated to dishes such as Kohlrabi Salad, Roast Leg of Lamb Shawarma and Panfried Mackerel to name just a few. Â There was a palpable buzz in the dining room and the prep kitchen was filled with scents of fenugreek, sumac and cardamom…yum!